One of the three Baltic League Nations, Estonia has beautiful beaches and wooded enclaves to offer, and as a YFU student, you'll be able to experience it all! The most scarcely populated country in Europe boasts the world's second highest literacy rate. One of the three Baltic League Nations, Estonia has beautiful beaches and wooded enclaves to offer, and as a YFU student, you'll be able to experience it all! Tere päevast! This is just one of the ways to say hello in Estonia, where it's estimated that over 109 languages are spoken. If you want to experience a place that will challenge your mind with a mix of cultures and a blend of the traditional and the modern, then Estonia might be the place for you. Estonia is a fairly diverse nation, where Russians, Ukrainians, Finns, and Belarussians comprise significant portions of the population. The culture of Estonia can best be described as a balance of influences from a rich historical past and Estonia's present-day European neighbors. Estonian music blends traditional wind instruments and modern ones such as the accordion and fiddle, creating a distinct sound like no other. There are many festivals you can attend throughout the year that incorporate both song and dance -- maybe you’ll even find yourself doing the polka! Most people live in cities, though many have cottages in the country. For vacations, they enjoy adventures like canoeing or bicycle touring. Boating is an extremely popular pastime, and many people flock to Estonia's beach resorts each summer. You may also find yourself golfing or windsurfing with host siblings or friends or attending plays, movies, exhibitions, and concerts. No matter how you choose to spend your free time, you can be sure that your host family and friends will welcome you with open arms! One of the best ways to really understand Estonian culture is to attend a local high school. Estonia’s formal education dates back to the 13th and 14th century when monastic and cathedral schools were established - but you won't be stuck in the past when it comes to your education today! In a typical Estonian school, you can take a wide variety of subjects such as math, biology, art, music, language and sports. In Estonia, you'll find that your experience of the culture and your time spent in school will combine to create an experience that is uniquely yours. Both Soviet and European influences work together to create a wonderful culture with delicious food, welcoming people, and an interesting arts scene. In today's Estonia, the question of national identity is one that everyone is talking about - come see for yourself! Information regarding visas and other immigration processes will be provided upon enrollment. Visit the embassy website to learn more. Possible costs include transportation to school, schoolbooks, a residence permit (€65), and personal spending money. Please keep in mind that you will need to buy proper winter clothes and shoes suitable for the Estonian winter- in January and February temperatures can fall below -25° Celsius! Program tuition does not include personal spending money. YFU recommends that all students are vaccinated against any tick borne illnesses before departing to Estonia. Students should also bring a notarized and apostilled parent permission form with them on program. Schools in Estonia emphasize a high level academic performance. YFU students are typically placed in the 10th or 11th grade according to their age and interests. The classroom atmosphere is formal and students treat their teachers with respect, but if you are willing to work hard, teachers are happy to help you develop your skills! You will take classes at the upper secondary level in a wide variety of subjects, including Estonian, math, history, biology, music, art, and sports. YFU exchange students to Estonia also have the opportunity to attend a specialized program focused on Art, Film and Media, Music, Nature, or Theater. For each of these programs, students will attend a traditional high school and take courses in their chosen specialization. All students applying for year program must be available for a mandatory 3-day National Pre-Departure Orientation, which usually takes place in mid-July or early December. This orientation is a required part of the program aimed at preparing students for their experience overseas. All students will participate in a one-day local pre-departure orientation in May or June. YFU Estonia will provide a four-day post-arrival orientation, which includes a basic language course. They will also offer gatherings for YFU students and their host families throughout the year, and a re-entry session for two days in June. Art Program: The art program is perfect for students who are mainly interested in fine arts. Artistic woodcarving and working with textile, amber, leather, and stone is very popular, and is available as a specialty in many schools all over Estonia. In the special arts program, you will attend a public high school that focuses on the arts, or you will attend a regular high school and take afternoon classes at a special art school. You will take general subjects (like Estonian language, biology, history, etc.) as well as choose from a wide variety of art lessons, which typically take place at least 10 hours a week. You will be able to study subjects like art history, drawing, painting, graphic arts, ceramics, textile design, leather art, wood restoration, iron work and more. Please submit photographs of at least six of your previous pieces of artwork with your application. Film and Media: Several high schools have special programs for Media and Movie, where students can learn the theory and practice of movie making. In school, you will have a normal curriculum in addition to extra subjects focused on media and movies such as computer design, photography, history of film making, and movie making. Students may also get the opportunity to volunteer for Estonia's biggest film festivals, and in some towns join an after school film club at a local youth center. Students must submit an example of their previous film work or a letter of motivation to take part in the program. Music: Students will attend state-run, music-focused high schools that are organized into two cycles -- one for academic education and one for music. The level of music education is very high, and studies will consist of subjects such as music theory, instruments, solfeggio, and performance auditions, or participation in choirs and orchestras. Please submit at least one CD with examples of your music level, as well as a written description of your music studies and experiences, along with your application. Nature: More than 50% of Estonia is covered in forests, and the country has over 1,000 lakes! Estonia offers nature lovers a pristine and untouched landscape to explore. This innovative year program offers students many opportunities to learn about and appreciate the environment of this Baltic country. 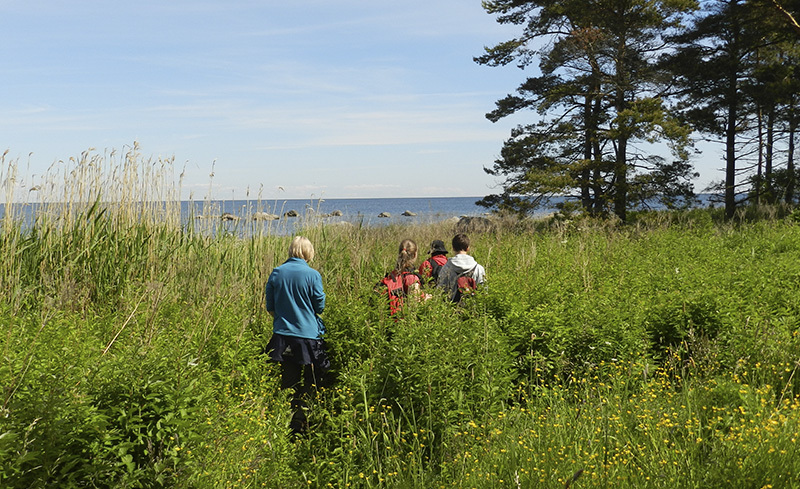 In addition to the regular academic program, students will take field trips each month to diverse locations throughout Estonia and its islands. You will not only appreciate the natural beauty of Estonia, but you will also learn about environmental problems the country is facing. This is the perfect program for the adventurous nature lover! Tentative activities (weather dependent) offered for the Nature program include canoeing the Ahja and Vohandu Rivers; visiting the island of Piirissaar, the virgin forests of Alutaguse, the Old Shale Mine Park in Kohtla-Nomme, Lahemaa National Park, the Alam-Pedja Nature Conservation, the Polula Fish Farm, and the peninsula of Noarootsi; skiing in Korvemaa; taking an ice road to Vormsi Island; and bird watching in Matsalu National Park! Note: The Nature Program may not be suitable for students with serious health issues or allergies. Theatre: During your stay in Estonia, students will attend regular academic classes during the day and participate in a highly professional after school theatre program. The theatre program also gives you the opportunity to take part in an Estonia-wide School Theatre Festival. Please submit photos of yourself participating in a play or acting group, and a motivational statement explaining why you want to participate in the theatre program with your application. Fall departure: February 15, 2001 - August 16, 2004. Spring departure: July 5, 2000 - January, 2004. Students who do not meet this age requirement or will graduate from high school before the start of their program will be considered for admission on a case-by-case basis. Estonian. Previous language study is not required. Students may also be placed with Russian-speaking families. YFU host families live in rural, suburban, or urban areas, including cities like Tartu, Tallinn, and other towns. Southern Estonia/Latvia Trip: Students may have the opportunity to travel to Southern Estonia and Latvia for a three-day trip to see the beautiful countryside. This is also a great time for students to see a lot of the similarities and differences of the Baltic countries. Weekend Trip to Finland: Students may have the opportunity to travel to Helsinki to get a glimpse into how their new neighbors to the north live. Trip to Narva: Students will travel to Narva- a town in Estonia that shares its border with Russia. The trip typically takes place over 2 days in March or April. On this trip, students will get to visit the fortress as well as meet other local students for a debate, and to discover one of Estonia’s hidden gems.